The 2008 Le Clos Jordanne Village Reserve Pinot Noir VQA Niagara Peninsula VQA was that second wine I opened during Thanksgiving weekend. This was the wine we had with our turkey dinner, a wine that matched perfectly with the brined and roasted turkey and all the accroutrements. With a brickish ruby colour, the nose opened with sour cherry, mushroom, a hint of bingo dabber, slightly damp forest floor and under-ripe plum. 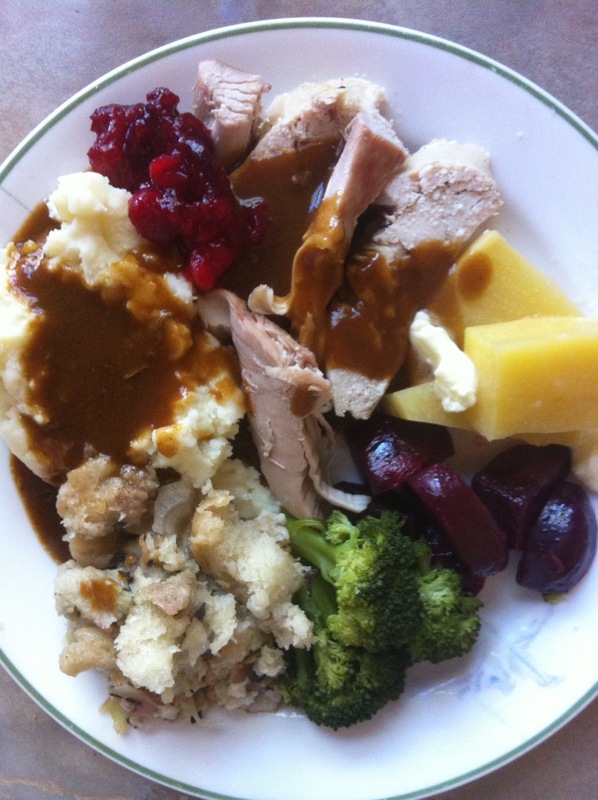 The fully softened tannins contributed to flavours of chalky cranberries, a hint of soy sauce, and red fruits -sour cherry, raspberry, red plum. 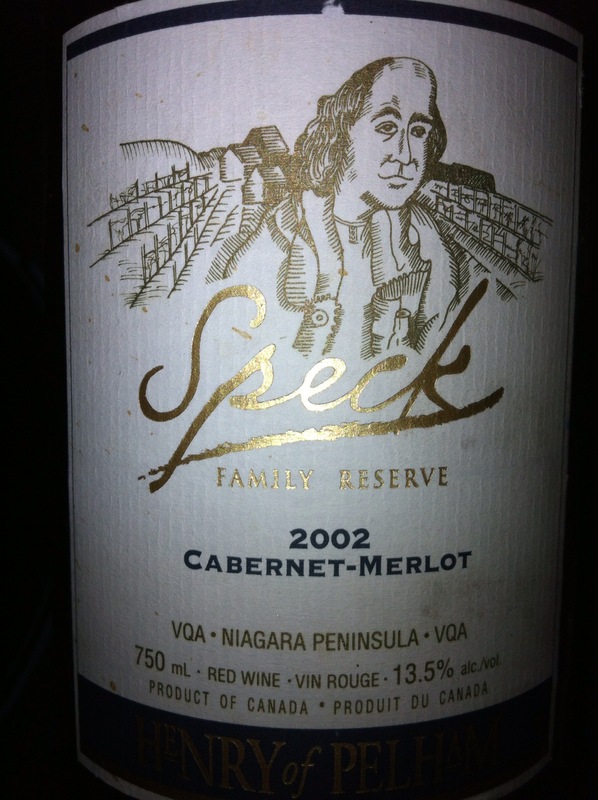 While the 2002 Henry of Pelham Speck Family Reserve Cabernet-Merlot VQA Niagara Peninsula VQA was quite masculine, this was more feminine in nature and needed time to open. I would say this Pinot is at its prime and drinking beautifully now. Family get-togethers such as Thanksgiving, Easter and Christmas are great reasons to open up those special bottles of wine from the cellar. For both the selections I took down to my parent’s place I chose wines that I had more than one bottle of to see how they were evolving. The first bottle opened on the weekend was the 2002 Henry of Pelham Speck Family Reserve Cabernet-Merlot VQA Niagara Peninsula VQA that I picked up on a trip to the Niagara Region in 2007. The Speck Family Reserve is the highest tier of wines produced by Henry of Pelham, wines made for cellaring and longer-term enjoyment. Made from a blend of Cabernet Sauvignon (33%), Cabernet Franc (19%) and Merlot (48%), the fruit was cropped at approximately 2 tonnes per acre from some of the oldest blocks held by the Speck Family. With a saturated inky purple colour, I was surprised that there wasn’t even a hint of brick on the rim after over 10 years of bottle age. The nose matched the deep, dark colour with copious dark fruit – blackberry, black cherry, black raspberry – along with printer’s ink, wet chalkboard, nasturtiums and a hint of black pepper and a high floral note. My beautiful wife detected black cherry, black plums and cinnamon. The dark fruit was replayed on the palate, dusty dry tannins with grip and bite (in a good way) and a spicy fruitiness. My beautiful wife thought it tasted like leather and plums. This wine still had a brooding strength, a powerful, manly wine that is still in-your-face in its style. Simply awesome, I am so happy I bought two bottles 7 years ago and have had the patience to not open them. It will be a lot tougher now that I know what a treasure lies beneath that other cork. Another Wednesday night, another #ONWineChat on Twitter. With this week’s topic being your favourite Ontario wine story from the summer, it got me to thinking that I really d0n’t have a wine story from this summer. The closest story I have is from a recent trip to pick up a whole hog from Harriston Packers for a pig roast I was doing and a visit to Hoity Toity Cellars (formerly Carrick Wines and Ciders) in Mildmay. 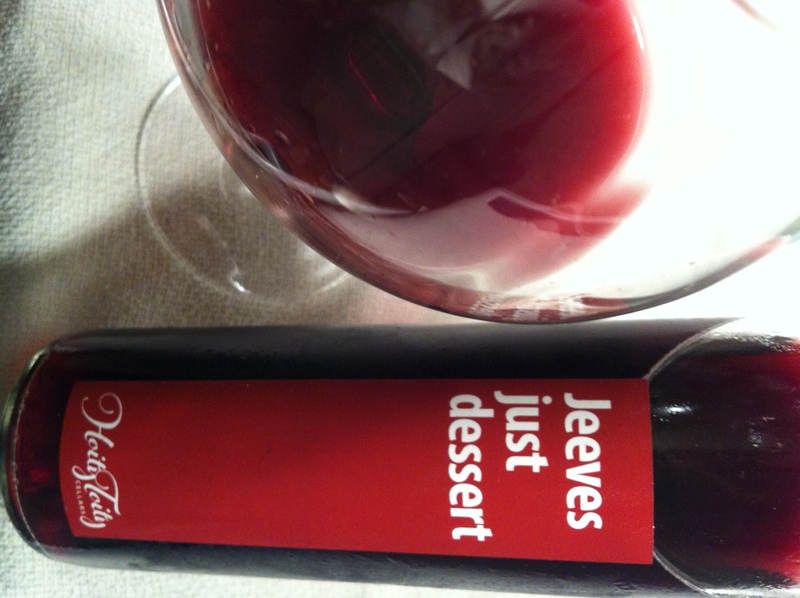 I picked up a few bottles after tasting their wine portfolio, with one of them being a red dessert wine made from the Frontenac grape called Jeeves just dessert. With a bright ruby red colour, the nose opens with a hint of candy apple and some aged sherry notes. The mouthfeel has a slight carbonic tinge with upfront sweetness and a refreshing dryness on the finish. Somewhat of a paradox of sweetness (not cloying) and dryness (but with no tannins) together, refreshing acidity. Not a typical dessert wine at all, but none of the Hoity Toity wines are typical. At $4.50 for a 500 mL bottle for a limited time, the value is amazing!